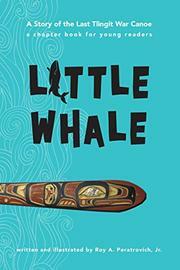 American Indians in Children's Literature (AICL): Debbie--have you seen LITTLE WHALE by Roy A. Peratrovich, Jr.? Debbie--have you seen LITTLE WHALE by Roy A. Peratrovich, Jr.? This morning as I started to read the Summer 2016 issue of Children & Libraries a book cover caught my eye (that's it, to the right). Inside the front cover is a page of new books for children and young adults. Little Whale is displayed. Keet, a ten-year-old Tlingit Indian boy, stows away for a voyage on his father’s canoe . . . and soon finds himself caught in the middle of a wild seastorm. The story carries him far from his home village, and when he makes land, he winds up right in the middle of a dangerous dispute between two Indian clans. The story of how he copes with these surprises and extricates himself from danger is dramatic and unforgettable. And it’s mostly true. Roy Peratrovich here builds a wonderful children’s tale on the bones of a story his own grandfather passed down. His accompanying illustrations bring the people and landscapes of Alaska—to say nothing of the adventures!—to stunning life, drawing young readers into a long-gone time when the whims of nature and man could suddenly test a boy’s courage. I'm definitely interested in this one! The author is a member of the Raven Clan of the Tlingit Tribe of Southeast Alaska. Check out his bio. I'll get a copy and be back with a review.